Case 1: A 30-year-old male patient reported to our department with the complaint of a burning sensation and ulceration in the mouth for 10 days. History revealed that the patient had undergone oral prophylaxis at a private dental clinic 15 days back. Five days later he suffered from fever and sore throat, followed by a blister formation in the mouth and lips. The blisters subsequently burst and formed large ulcers in the mouth and lips. The burning sensation was severe in intensity and aggravated on taking hot and spicy food. The patient had been prescribed topical analgesic medication, cetirizine and multi-vitamin capsules by a private medical practitioner. As the patient didn’t get any relief, he was referred to our department for the same. The patient didn’t have a significant medical history. On examination, bilateral submandibular lymph nodes were palpable, enlarged and tender. Extra-orally, lips were swollen with bloody encrustations Figure 1. Multiple, diffuse erosive areas covered with grayish necrotic slough were seen on the upper and lower labial mucosae, left and right buccal mucosae and soft palate Figure 1. The areas bled on slight manipulation. A provisional diagnosis of EM minor was made. Routine hematological investigations were normal. The patient was started on systemic steroid therapy. Oral Prednisolone 30mg/day in divided doses was given which was tapered over 9 days. Benzydamine hydrochloride and chlorhexidine gluconate mouthwash were given for symptomatic relief. The patient was evaluated after a week and showed complete resolution of the intra-oral erosive areas Figure 2. The patient was advised to apply petroleum jelly to the lips to prevent dehydration and cracking of the encrustations. Figure 1 Pretreatment photographs showing bloody encrustations on the lips, diffuse erosions covered with necrotic slough on the labial mucosae, buccal mucosae and soft palate. Figure 2 Post-treatment photographs showing complete resolution of the lesions. 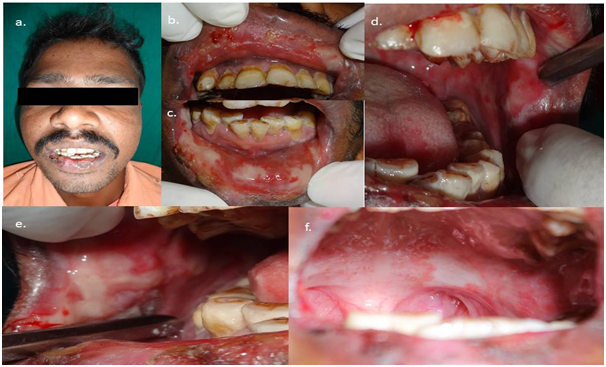 Case 2: A 25-year-old male patients was referred to our department by a private medical practitioner for an opinion regarding non- healing intraoral ulcers for 3 weeks. History revealed that the patient had similar bouts of ulceration in the mouth 5 times in the past 1 year. The ulcers were associated with fever and burning sensation in the mouth, which aggravated on eating hot and spicy food. The ulcers healed in 10-15 days without any therapy. Presently, the ulcers persisted for 3 weeks due to which the patient visited a private medical practitioner. He was prescribed antibiotics, analgesics and multivitamins for the same. As he didn’t get any relief, he was referred to our department for further management. Presently, the patient gave a history of fever and sore throat 25 days back, followed by a burning sensation in the mouth and lips for 3 weeks. On examination, bilateral submandibular lymph nodes were palpable and tender. Extra-orally, the lips showed brownish encrustations which bled easily on stretching the mucosa. Intraorally, diffuse erythema was seen on the upper and lower labial mucosae, diffuse erosive areas on the ventral and lateral surfaces of the tongue Figure 3. A clinical diagnosis of recurrent erythema multiforme minor was made. Laboratory investigations revealed a raised serum IgG for Herpes Simplex Virus 1. Hematological investigations were within normal limits. A final diagnosis of HSV induced recurrent erythema multiforme was made. The patient was started oral Prednisolone therapy 30 mg/day in divided doses tapered over 9 days. Topical triamcinolone acetonide 0.1% was given for application on the lips. Benzydamine hydrochloride and chlorhexidine gluconate mouthwash were given for symptomatic relief. The patient was evaluated after a week and showed a complete resolution of the lesions Figure 4. The patient was educated regarding the recurrent nature of the disease and was advised to consult an oral physician at the earliest when the first prodromal symptoms appear. Figure 3 Pretreatment photographs showing bleeding encrustations on the lips, diffuse erosions on the labial mucosae and ventral and lateral borders of the tongue. Figure 4 Post-treatment photographs showing complete healing of the lesions. Case 3: A 40-year-old male patient reported to the department of oral medicine with the chief complaint of a burning sensation in the oral cavity since 2 days, which was severe in intensity, continuous and was associated with moderate pain on having food and opening the mouth. There was also associated bleeding from the lips. The patient gave a history of a headache 3 days back and self-medication with diclofenac sodium 50mg for the same. Next day he noticed swelling and blister formation on his lip, which later ulcerated and was bleeding. He consulted a physician regarding the same complaint and was given anti-allergic drugs. But later he developed more widespread ulcerations in his mouth with severe burning sensation and inability to eat. The patient did not have any positive medical history and was not on any other medication. On examination, there was a bulla present on his left palm Figure 5. Bilateral submandibular lymph nodes were palpable and tender. Intraoral examination revealed oedematous lips with bloody encrustations & irregular shaped superficial ulcerations & erosions with fresh bleeding spots. Multiple, diffuse, irregular superficial ulcerations were seen on the right side buccal mucosa, upper & lower labial mucosa and dorsal, lateral & ventral surfaces of the anterior 2/3rd of the tongue. The ulcers were covered with yellowish slough and surrounded by diffuse erythema Figure 5. The patient had hypersalivation and halitosis. Other dermal and mucosal surfaces showed no abnormality. Routine hematological investigations were within the normal limits. Clinically, a diagnosis of drug-induced erythema multiforme minor was made. Oral Prednisolone 30mg/ day was started along with topical triamcinolone acetonide 0.1% for local application, in addition, mouthwashes consisting of local anesthetics and antiseptics were added for symptomatic treatment. 1st recall on 5th day revealed almost complete healing of the oral lesions. Prednisolone was later withdrawn after tapering for the next 5 days & there was complete healing of the lesions Figure 6. 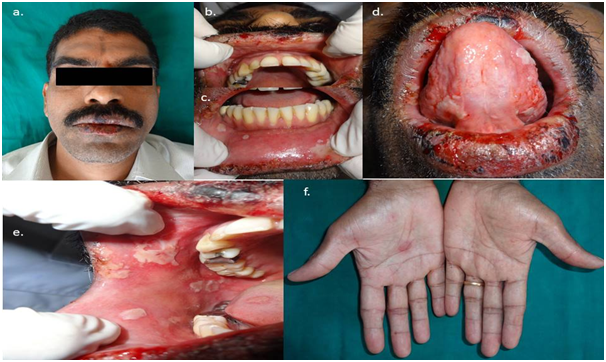 Figure 5 Pretreatment photographs showing red encrustations on the lips, superficial ulcerations on the labial mucosae, ventral surface of the tongue, left buccal mucosa and a ‘target- lesion’ on the right palm. Figure 6 Post-treatment photographs showing complete healing of the ulcers and encrustations of the lips. ‘Typical targets’ are defined as individual lesions less than 3 cm in diameter with a regular round shape, a well-defined border, and two concentric palpable oedematous rings, paler than the center These lesions are commonly seen symmetrically distributed in extensor surfaces of the extremities in EM minor or milder forms of EM major. ‘Raised atypical targets’ appear similar to target lesions and are palpable erythematosus lesions with a rounded shape but poorly defined borders and a dark central area, which may erode and become necrotic. These lesions are most commonly encountered in the severe form of EM major or SJS. ‘Flat atypical targets’ are non-palpable ill-defined erythematosus areas with a tendency to form central blister and are most commonly seen in SJS. ‘Erythematous or purpuric macules with or without blister formation’ are of variable size and may become confluent and are most common in SJS and TEN. 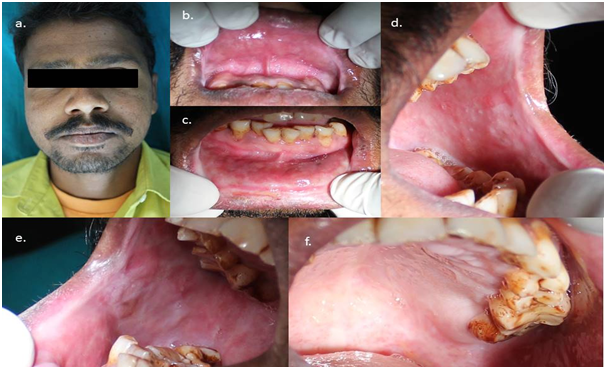 Kohli PS, Kaur J. Erythema multiforme‒oral variant: case report and review of literature. Indian J Otolaryngol Head Neck Surg. 2011;63(Suppl 1):9‒12. Scully C, Bagan J. Oral mucosal diseases: erythema multiforme. Br J OralMaxillofac Surg. 2008;46(2):90‒95. De Arruda JA, Silva P, et al. Erythema multiforme induced by alendronate sodium in a geriatric patient: A case report and review of the literature. J Clin Exp Dent. 2017;9(7): 929‒933. Farthing P, Bagan JV, et al. Mucosal disease series. Number IV. Erythema multiforme. Oral Dis. 2005;11(5):261‒267. Auquier Dunant A, Mockenhaupt M, et al. Severe cutaneous adverse reactions. Correlations between clinical patterns and causes of erythema multiforme majus, Stevens‒Johnson syndrome, and toxic epidermal necrolysis: results of an international prospective study. Arch Dermatol. 2002;138(8):1019‒1024. Huff JC, Weston WL, et al. Erythema multiforme: a critical review of characteristics, diagnostic criteria, and causes. J Am Acad Dermatol. 1983;8(6):763–775. Sokumbi O, Wetter DA. Clinical features, diagnosis, and treatment of erythema multiforme: a review r the practicing dermatologist. Int J Dermatol. 2012;51(8):889‒902. Ayangco L, Rogers RS. Oral manifestations of erythema multiforme. Dermatol Clin. 2003;21(1):195‒205. Roujeau JC. Erythema multiforme. In: Wolff K, Goldsmith LA, Katz SI, et al, editors. Fitzpatrick’s Dermatology in General Medicine. 7th ed. New York:McGraw‒Hill;2008. Wetter DA, Davis MD. Recurrent erythema multiforme: clinical characteristics, etiologic associations, and treatment in a series of 48 patients at Mayo Clinic, 2000 to 2007. J Am Acad Dermatol. 2010;62(1):45‒53. Schofield JK, Tatnall FM, et al. Recurrent erythema multiforme: clinical features and treatment in a large series of patients. Br J Dermatol. 1993;128(5):542‒545. Chen CW, Tsai TF, et al. Persistent erythema multiforme treated with thalidomide. Am J Clin Dermatol. 2008;9(2):123‒127. Pavlović MD, Karadaglić DM, et al. Persistent erythema multiforme: a report of three cases. J Eur Acad Dermatol Venereol. 2001;15(1):54‒58. Tzovaras V, Liberopoulos EN, et al. Persistent erythema multiforme in a patient with extrahepatic cholangiocarcinoma. Oncology. 2007;73(1‒2):127‒129. Boras VV, Andabak Rogulj A, et al. Adverse drug reactions in the oral cavity. Acta Clin Croat. 2015;54(2):208‒215. Williams PM, Conklin RJ. Erythema multiforme: a review and contrast from Stevens‒Johnson syndrome/toxic epidermal necrolysis. Dent Clin North Am 2005;49(1):67‒76. Ng PP, Sun YJ, et al. Detection of herpes simplex virus genomic DNA in various subsets of erythema multiforme by polymerase chain reaction. Dermatology. 2003;207(4):349–353. Caproni M, Torchia D, et al. The CD40/CD40 ligand system is expressed in the cutaneous lesions of erythema multiforme and Stevens‒Johnson syndrome/toxic epidermal necrolysis spectrum. Br J Dermatol. 2006;154(2):319–324. Nassif A, Bensussan A, et al. Drug specific cytotoxic T‒cells in the skin lesions of a patient with toxic epidermal necrolysis. J Invest Dermatol. 2002;118(4):728–733. Michaels B. The Role of Systemic Corticosteroid Therapy in Erythema Multiforme Major and Stevens‒Johnson Syndrome: A Review of Past and Current Opinions. The Journal of Clinical and Aesthetic Dermatology. 2009;2(3):51–55. Fukiwake N, Moroi Y, et al. Detection of autoantibodies to desmoplakin in a patient with oral erythema multiforme. Eur J Dermatol. 2007;17(3):238‒241. Patil B, Hegde S, et al. Oral blistering ‒ report of two cases of erythema multiforme & literature review. J Clin Diagn Res. 2013;7(9):2080‒2083. Bean SF, Quezada RK. Recurrent oral erythema multiforme. JAMA. 1983;249(20):2810–2812. Aurelian L, Ono F, et al. Herpes simplex virus (HSV)‒associated erythema multiforme (HAEM): a viral disease with an autoimmune component. Dermatol Online J. 2003;9(1). Siegel MA, Balciunas BA. Oral presentation and management of vesiculobullous disorders. Semin Dermatol. 1994;13(2): 78‒86. Conejo Mir JS, del Canto S, et al. Thalidomide as elective treatment in persistent erythema multiforme; report of two cases. J Drugs Dermatol. 2003;2(1):40–44. Geraminejad P, Walling HW, et al. Severe erythema multiforme responding to interferon alfa. J Am Acad Dermatol. 2006;54(Suppl 2):S18–21. Bakis S, Zagarella S. Intermittent oral cyclosporin for recurrent herpes simplex‒associated erythema multiforme. Australas J Dermatol. 2005;46(1):18–20. ©2018 Krishnankutty et al. This is an open access article distributed under the terms of the Creative Commons Attribution License , which permits unrestricted use, distribution, and build upon your work non-commercially.